Transparency still hard to dig up according to those punters who visited the Melbourne Museum’s Golden Age of the Pharaohs exhibition. 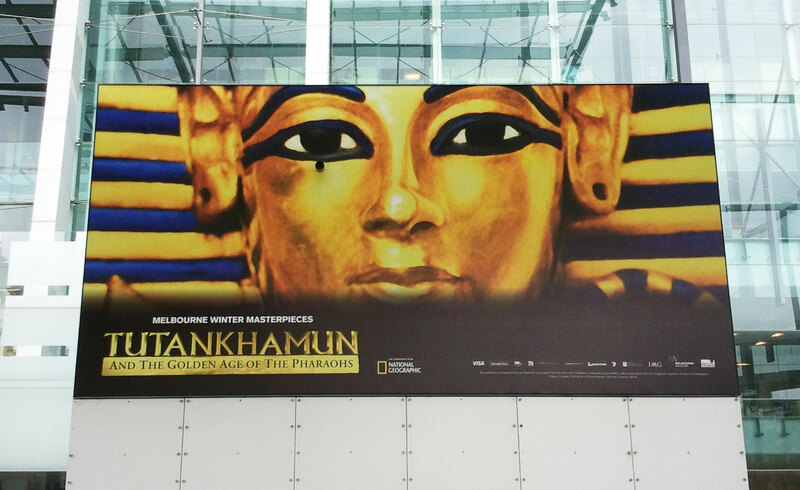 For Mother’s Day, I took mum to the Tutankhamun and the Golden Age of the Pharaohs exhibition at the Melbourne Museum. If you’re a Melbournian (or a TV watcher anywhere in Australia) you would have seen something of the aggressive marketing campaign preceding and during the exhibition. Images of the boy king populate tram stops throughout the city, flags with his face flutter in Flinder’s Street and billboards continue the eternal stare of his death mask that appear in all of the campaign material. The problem is it isn’t here. The well-known death mask of Tutankhamun that everyone knows and is the corner stone of the exhibition’s marketing material doesn’t appear in the exhibition. Imagine our surprise when, after moving through a warren of artefacts that help to explain the life the boy king grew up in, including more from around two generations before him, arriving at the end to a half-empty room that featured his sceptre, dagger and crown, but no mask. Where is it? According to mask’s custodians, The Egypatian Museum in Cairo, it is too fragile to travel overseas (in fact, they’ve determined that it will likely never leave Cairo again). Then why has Melbourne Museum used it in its marketing material? The simple answer is recognition. Of all Tutankhamun’s artefacts, his death mask is the one that wowed the world. It is a beautiful piece of history; to be able to see it in your lifetime should be on the bucket list. Where is the Golden Mask? Tutankhamun’s Golden Mask (or Funerary Mask or Death Mask) is at its home in Cairo at The Egyptian Museum. It is a very popular object that travelled to London and the USA in the 1970s exhibition, so many individuals have fond memories of it. Because it is so fragile, the Egyptian government has decided that it will not travel again. So here’s my question: have we been duped? Were our expectations too high? It has been said by some marketers that too much is assumed by customers once a campaign has been activated. But is that the fault of the consumer? Since my experience at the exhibition, I’ve heard a number of visitors having the same problem – expecting a death mask but coming up empty-handed at the end. I heard one suggest on commercial radio that the museum was capitalising on the popularity of the mask to get more feet through doors. And when it faces stiff school-holiday competition from the National Gallery of Victoria, Melbourne Zoo and Aquarium, who can blame it? But a reputation for transparency is hard to regain once lost (just ask the marketing team at Grill’d). All I can say is we came away bewildered and wanting more – like the golden mask that I saw on the tram stops, billboards and fluttering flags.